P. Bernardi: Microprocessor and On-line Test, K. Chakrabarty: Emerging Technologies in Test, P. Girard: Power Issues in Test, S. Hamdioui: Memory and Nanotechnology Test, E. Larsson: Test Architectures and Standards, G. Léger: Analog/Mixed Signal Test , M. Maniatakos: Security and Trust Issues in Test, I. Polian: Test Generation and Reliability, J. Rivoir: Automatic Test Equipment and Yield, C. Scholl: Validation and Verification, A. Singh: Defect-based Test and Variability. ETS'18 will produce electronic formal Proceedings including all scientific papers, with ISBN number to be indexed in the IEEE Xplore Digital Library and other bibliographical search engines. 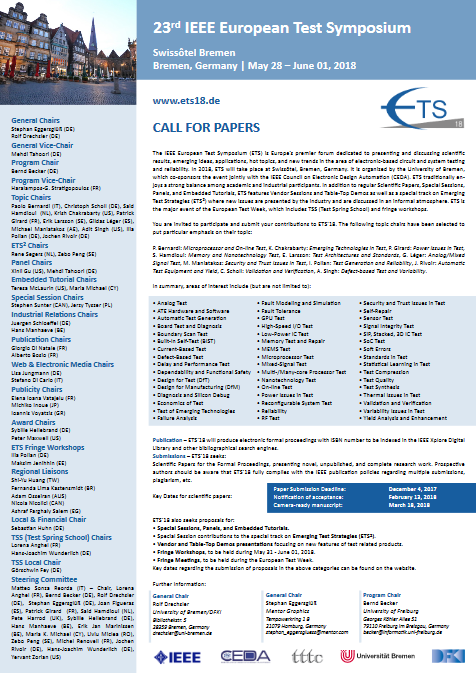 The Best Paper Award of ETS'18 will be presented at ETS'19. For more information, please contact the Program Chair Bernd Becker.